This month, the Crazy Cooking Challenge is to bake a chocolate cake. I decided to make Betty Bake’s Chocolate Beetroot Cake as I was wondering whether Dave, who does not like beetroot, would notice it in the cake. No-one who had a taste of this cake knew it had beetroot in other than Dave – and he thinks it is great. It has a lovely deep colour and not too overwhelming a chocolate taste. It got a resounding thumbs up from the taste panel. Betty Bake has a gluten free recipe, but as this is not a concern for me, I used ordinary flour and substituted the sugar! The one great thing about this challenge is that I get to show case my fellow South African bloggers. Betty Bake was more than happy to let me use her recipe, and I am more than happy to be able to share it with you. to get one cup of cooked beetroot I took 250g of peeled and julienned beetroot and popped it in the microwave for 4 minutes. I then used my immersion blender to purée it. This was really a no mess, no fuss option. I have never had a beetroot cake but yours does look so fabulous. I am very fond of a good & decent chocolate & beetrrot cake & yours is using canola oil instead of butter: I like that change a lot :)! Your cake looks delicious. I can’t believe you have beetroot in the cake, great way to get your vegetables in diet. thanks, it is perfect for kids who don’t like to eat the healthy things! It looks like a very moist and soft cake! I haven’t used beetroot in baking, but sounds very intriguing! please try it and see if your partner notices the beets! Chocolate cake is a great place to hide vegetables. The cocoa flavor usually overrides any other flavors and the vegetables add such a nice moistness. This is a lovely cake. Your cake is awesome, I just love the addition of the Beet. Thanks for sharing and have a wonderful week! This is incredibly cool. I have not seen a cake using beetroot before. Very unique. Looks like a great cake and WOW beet roots – I would of never thought of that! I have put puree zucchinni before in Chocolate Cake! Thanks for participating, come check out my Whopper Cake, if you haven’t had a chance (it’s #1 in the linky party)! I love when sweets are offset enough that they’re not cloying and I think the beetroot takes care of that problem. This looks delicious and I will give it a try as soon as my beets come in… Thanks for sharing. Come visit when you can. I’m #29. I have heard that cake made like this is great but have not yet got round to making it. it looks good too! Is canola oil like vegetable or sunflower oil? Looks delicious Tandy. Strange that you can’t taste the beetroot. Must definitely give this lovely recipe a try. Great way to sneak in some veggies too! I’ve never tasted beetroot but it does look like one wonderful cake. Well it certainly looks delicious, Tandy. A very novel idea indeed. Would the springform pan be a full size 23cm? Looks fantastic! I made a beet cake for my blog a few months ago. I love the addition of sweet beets. I haven’t worked with beetroot before, but it sounds like it will lend wonderful moisture to the cake! I’ve been considering making a chocolate cake with beetroot in for a while now. I love the idea of making chocolate cake healthier but still keeping all the moisture of the cake. It looks lovely. Yum! I found a beet chocolate cake recipe and pinned it. We grow beets and it seems like a wonderful way to use the vegetable. Thanks for posting! Your cake looks fantastic. I have yet to cook with beetroot, but you have certainly given me a good reason to try it. Yum! So if it has beetroot in it… can we call it a serving of vegetables???? 🙂 Looks Yummy and moist. 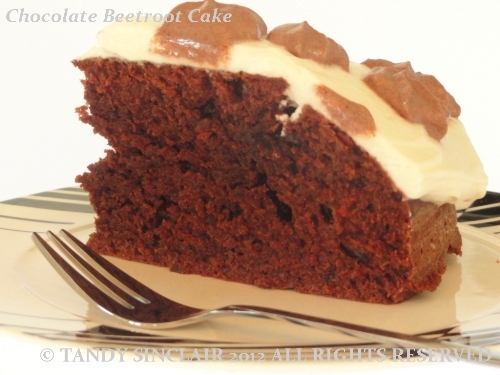 I’ve heard about using beetroot in chocolate cake, but I haven’t tried it myself. It looks wonderful, and very moist! Absolutely fabulous. Love the beetrooot addition. So innovative. Hmmm beetroot, can’t say I’ve used it before! Looks delicious though! thanks Jen, worth the try! I can’t quite imagine the taste, don’t use beetroot much. But it looks delicious. we don’t use beetroot much either, but you could not taste it at all!